From a company called Griddly Games comes a fast-paced word game you don’t have to be a spelling bee champion to enjoy. It’s called Show Me the Kwan and it’s as easy to learn as it is fun to play for people of all ages from 8 year olds to grown ups. In fact, it’s simple enough to sum it up in just a paragraph. Here goes… As long as you can sound out the first letter, the second letter, or the last letter of a word, you Kwan play this game (no, that is not a typo). Simply pick a category from one of two levels of playing cards (for example, “in the park”), roll the special die to see if the goal of the round is to find the first, second, or last letter of something you might find in the park, then flip the timer and let the word play begin. Blurt out words and grab letters until all the dice are scooped up. At the end of each round, tally up the points on the dice you’ve collected. There are two ways to win. Either be the first to earn 25 points or achieve the ultimate Kwan by using just one letter to make three different words each time using the letter in a different place. Look up Kwan in the dictionary and you’ll find several definitions for it. But to Griddly Games, Kwan is just another way of saying awesome which is exactly the word our testers used to describe Show Me The Kwan. Family game night, anyone? 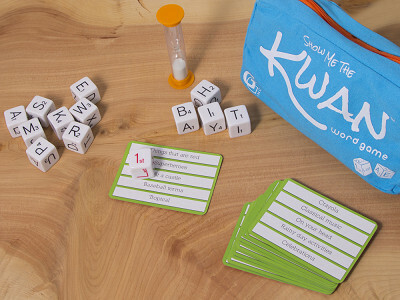 I am very pleased to be introducing you to Show Me The Kwan, the fun, exciting and fast-paced word game. This game is really exciting as it allows everyone to play a word game together whether or not they are great at spelling! I know that for us here we have had a lot of issues with the slow pace of word games and the level of difficulty when trying to play with many levels of players. 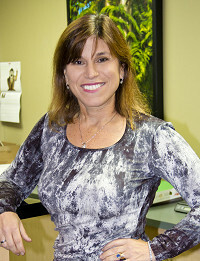 I am here all day to answer any and all of your questions! Please shout out at me if you have ANY comments or questions. I am more than excited to be here to answer them all day. Thanks so much for checking us out and I look forward to hearing from each and every one of you! Can 1 individual play it? @Lisbeth It would definitely be more fun in a group. Since the goal is to achieve more points than those you are playing against. I have played it on my own as a brain exercise though. Attempting to see if I could come up with a word for each die within my chosen category. Since the family I married into is 'Quan', will this game work for me? Be a fun gift? Or would you make a special edition called 'Show Me The Quan' for my uses? :-) It looks like fun! @Elizabeth Unfortunately we can't print any special named bags for the moment! This would make a great gift! It is so much fun to play in a group or family at any get together. Looks like fun. Because I always do, I checked Amazon for their price-- $26.95!! 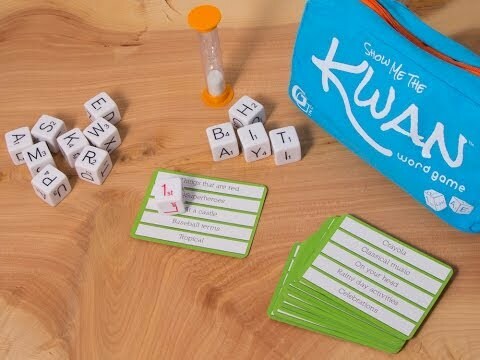 As long as you can sound out the first letter, the second letter, or the last letter of a word, you Kwan play this game (no, that is not a typo). Simply pick a category from one of two levels of playing cards (for example, “in the park”), roll the special die to see if the goal of the round is to find the first, second, or last letter of something you might find in the park, then flip the timer and let the word play begin. 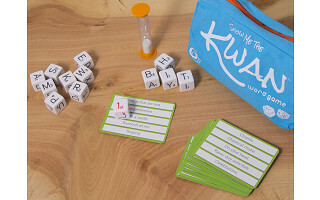 Blurt out words and grab letters until all the dice are scooped up. At the end of each round, tally up the points on the dice you’ve collected. There are two ways to win. Either be the first to earn 25 points or achieve the ultimate Kwan by using just one letter to make three different words each time using the letter in a different place.